Like humans often do on New Year’s day when they throw out all the chips, crackers and soda they have on hand and attempt to leap into eating kale, beets and brown rice, results can be mixed. When you live on junk food, your digestive system adapts as well as it can to deal with the processed starches and flours it has grown used to. Dogs are the same – if they are older and used to kibble, they may suffer from digestive or even familiarity issues if forced to go cold turkey. Dogs, too, may need a little time to adapt. After all the processed grain and other garbage, your dog’s system has become used to, he or she may have insufficient digestive bacteria and enzymes and a compromised immune system, so real food may be a bit tricky to digest until your darling’s internal environment improves. This isn’t anything to worry about – a few days of loose stools is perfectly normal and will (forgive the pun) pass quickly. We at Doggone Real recommend the cold turkey method or quick switch over 1-2 days only for puppies or very young dogs, which have healthier digestive systems and are less prone to diarrhea, constipation or other digestive problems. Introducing raw foods to your dog’s diet over a week (or longer, if needed) can greatly reduce or avoid digestive issues. It generally takes an adult dog 7-10 days for its gastric acidity to be restored to normal, healthy levels. You have choices about how to proceed, based on your dog’s age and overall health. People with older dogs or dogs with digestive issues should choose a longer transition period to help avoid digestive upset. 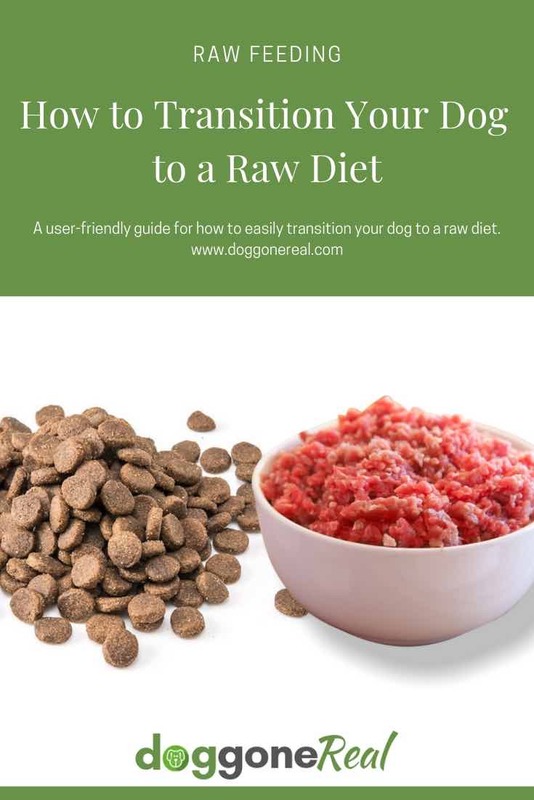 Another method for how to transition your dog to a raw diet is the ‘Treat Swap’. This is a good choice for puppies, young dogs and adult dogs in good health. 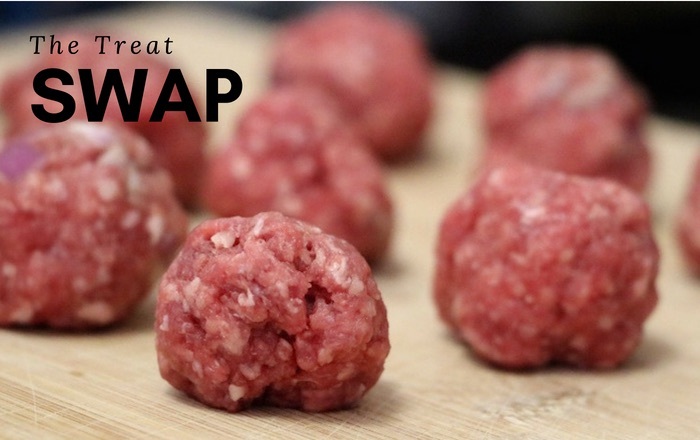 Little raw ground beef or ground turkey “meatballs” work great. Day 1: Start with adding a few raw treats and see how your dog reacts and if stools are solid. Days 2-4: Increase the number of raw treats that you give them pulling back on their old food just a bit and keep examining stool quality. Days 5-6: If stools are solid, replace a kibble meal with a raw food meal. 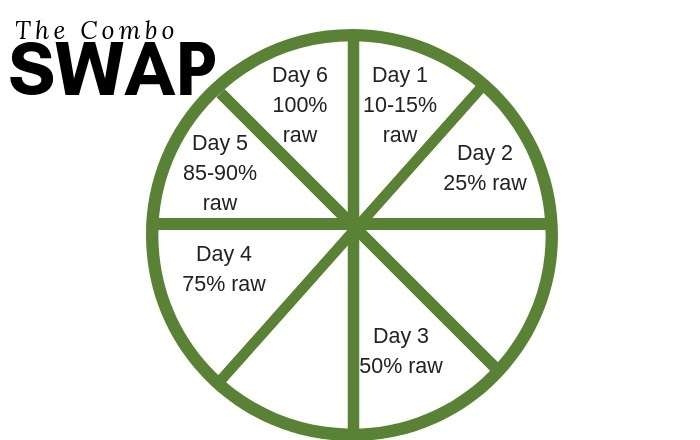 Day 7: If stools remain solid, replace all food with raw foods. This is a good option for all dogs, especially older dogs and those with digestive issues. If your dog eats two smaller meals instead of one big one, adjust each serving accordingly. 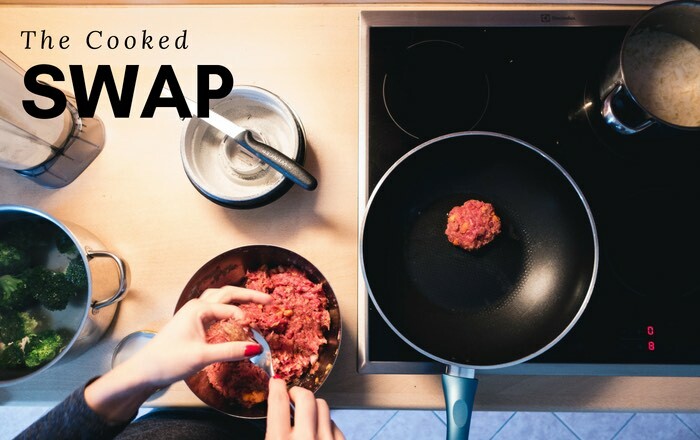 In this method, you are essentially swapping old food for new food in a gradual progression. Think of it like pieces of a pie. 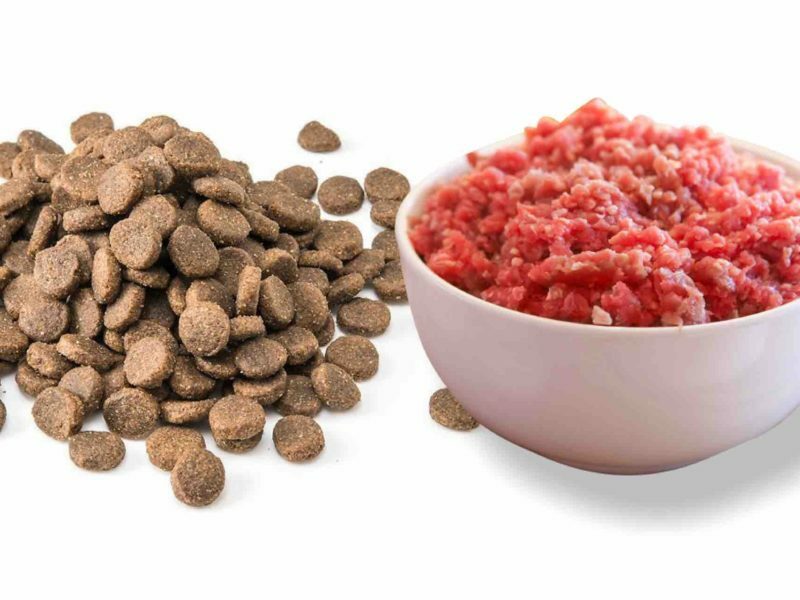 Day 6: Treat your dog to 100% raw food! This is just a guide and the transition can be slowed down to extend over 7-10 days or longer if desired. The point is for it to be a gradual change and for you watch how your dog responds to the change (digestion, stools, etc.). You can separate these servings into separate meals if you prefer. Use the same proportions, but feed your dog its old food in the morning and the raw food portion in the evening to get its system adjusted over the course of the week. We transitioned our 12-year-old dog this way and she actually would have preferred it went faster. After the first day or so of transitioning her, the raw food was all she would eat. She devoured the raw and left the dry food untouched in the bowl. That spoke volumes. This is a good option for older dogs, dogs used to cooked meats, and dogs with chronic health issues or weak immune systems. If your dog is very old, has GI disease or other issues, you can delay the time to transition based on your pet’s stools and overall reaction. Cooking should be restricted to raw meat. NEVER COOK BONES. If your dog has digestive issues, stay with each step until its stools normalize. Day 5: Serve it raw. Fast first – Fast your dog for 24-hours before you start any transition to raw as this will help detox their digestive system and ensure that they are hungry. Eliminate the typical treats during the transition process. Raw progression should be to start with raw ground meat, then move to muscle meat with bones such as a raw chicken leg or thigh and then move into organ meat. Watch their stools. 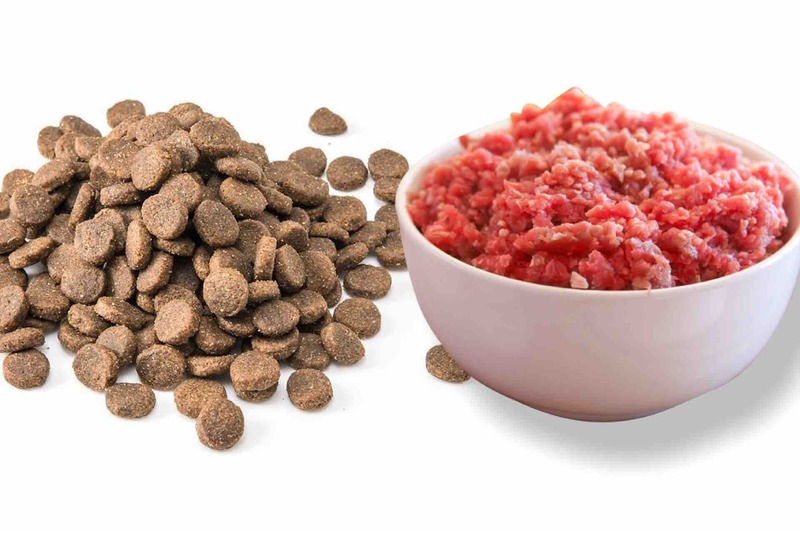 These should change for the better and get smaller and firmer as the dog’s body absorbs more of the wholesome and nutritious raw food and has less bad waste to eliminate. You may also see a slimy film around the stool which is ok as this is evidence of the dog’s body cleansing and eliminating toxins. Adult Dogs – Adult dogs should be fed based on weight. If your dog is overweight, you may want to adjust its portions slightly. You will notice that a more balanced weight is natural when you wean your dog off unhealthy grains, processed meats and useless filler. Based on a maintenance weight, serve your dog between 2-3 percent of its weight, or about ½ pound for every 25 pounds, in meat, bones, treats and supplements (if used) combined. We at Doggone Real recommend splitting your dog’s daily allowance of food into two smaller portions and serving him or her twice a day for maximal energy, with treats given when you deem fit. Perfectly Rawsome has a great calculator to offer more specific breakouts for how much muscle meat, bones and organ meat your dog should be eating daily. Puppies – Puppies, especially larger breeds, grow rapidly and burn a lot of calories. As a result, they need to eat up to 10 percent of their body weight in meat, bones, treats and supplements (if used) every day. If your puppy weighs 10 pounds, for example, feed it one pound of food, split up into 3 or 4 servings a day.